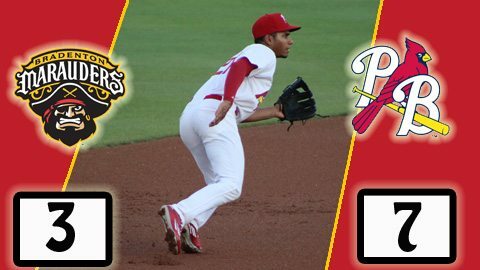 In front of a crowd of 2,714 on Wednesday afternoon, the Palm Beach Cardinals looked to continue their winning streak against the first-place Bradenton Marauders. Ian McKinney (4-3) got the start on the mound for the Cardinals, while Stephen Tarpley got the start for the Marauders. Palm Beach had an offensive charge in the top of the second inning, when they were able to string together four consecutive hits with two outs. It started when Andrew Sohn (1-for-4, 2B, R) doubled down the right field line, then Oscar Mercado hit an RBI single that scored Sohn. Next up to the plate was Jhohan Acevedo (who finished 1-for-3, BB), who singled to center field, and finally Darren Seferina (1-for-4, RBI, R, BB in the game), who lined an RBI single to center put the Cardinals up 2-0. But for Bradenton, Jerrick Suiter answered right back with a solo home run to make it a 2-1 game. Two innings later, with the bases loaded, Blake Drake (who went 2-for-5, 3 RBI, 2B, SB) cleared the bases with a double to make it a 5-1 Palm Beach lead. While last night was about the stellar pitching by ace Matt Pearce, Wednesday night was all about the offense of the Cardinals kicking it into high gear, outplaying the Marauders at the plate. It was a very rough afternoon for Tarpley (1-1), who went the first 4 innings for the Marauders, surrendering eight hits, five runs, one walk, as well as four strikeouts. With the dominate 7-3 victory, the Palm Beach Cardinals have climbed out of the cellar in the Florida State League South Division, and at 26-27, are just 2.5 games out of first place. On Thursday, RHP Colten Brewer (2-6, 4.36 ERA) will make the start for Bradenton, as they barely cling onto their first place lead. LHP Austin Gomber (4-3, 2.47 ERA) is set to start for the Cardinals, as they look to go to .500.